Last week, Moshi sent us a Moshi USB-C Multimedia Adapter for review. So that’s what we did. Disclaimer: this is not a paid review, but we received the item for free. If you own a new MacBook Pro you know how tough it can get to connect anything to your laptop. There are only 2 USB-C inputs (if you picked up the MacBook Pro 15.4″ you will have 4). That’s it! Not SD Card readers, no USB ports (! ), and don’t even think of HDMI ports. So how do you connect your SD-Card or your camera? And what about projectors or tv screens? And finally, how are you going to connect your (USB A) drives?? Well, here comes the solution: the Moshi USB-C Multimedia Adapter can do all of this. The Moshi USB-C Multimedia Adapter gets your USB inputs and SD card reader back to your MacBook Pro. Plus, you get an HDMI output to connect a monitor, tv, or projector. The design is quite sleek and the adapter is relatively small. What would be nice though is a slightly longer cable so it won’t hang in the air if you put your Mac on a laptop stand (a common set-up when you work with an external monitor). The Moshi USB-C Multimedia Adapter is a perfect companion when on the move because it is lightweight and it enables you to download your photos or videos from your SD card on your laptop or even an external hard disk which you could also connect using the Moshi USB A port. By the way, the USB A (USB 3.0) ports have a transfer speed of 5 Gbps. That’s almost as high as the latest USB 3 standard can get. Even if you get your hands on adapters with a faster transfer rate (USB 3.1), it may not help you much as most external drives can anyways not handle a speed over 5 Gbps. In addition to transferring data, the adapter will also charge your devices fast (even if your laptop is not connected to a power source). So no worries when your mobile or Apple Watch runs out of battery, just plug them into your Moshi USB adapter for a quick recharge. 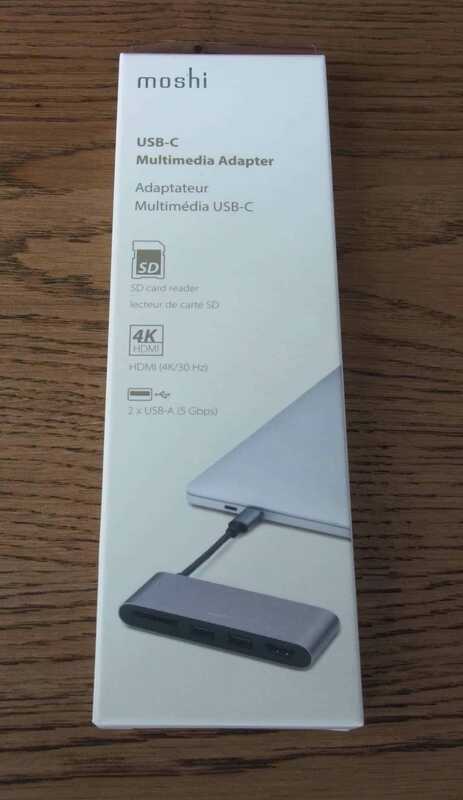 The USB-C Multimedia Adapter supports all types: SD, SDHC, and SDXC (HC = High Capacity, XC = Xtended Capacity). If your camera or smartphone uses micro SD cards you can just get a microSD to SD adapter. The transfer speed is up to 104 MB/s which is higher than most of the SD cards currently on the market (e.g. the popular Sandisk Extreme Pro can handle up to 95 MB/s). Moshi USB-C Multimedia Adapter: 1 SD Card Reader, 2 USB 3.0, and one HDMI connection. At 1080p the HDMI connection works at a refresh rate of 60 Hz and at 4K the refresh rate is 30 Hz. The adapter is also HDCP-compatible. This is as good as the Apple USB-C Digital AV Multiport Adapter. With this HDMI output, you can mirror your Mac on an external monitor or watch movies or your photos on a tv screen. Sleek design: the Moshi USB-C Multimedia Adapter matches the color of your MacBook Pro and weighs only 1.6 ounces (45 grams). The Moshi USB-C Multimedia Adapter is currently retailing at just under $60. This is a bit pricey considering that similar products are available under $30. However, you may want to be on the safe side and buy a product from a reliable company like Moshi. You can read more about Moshi on their website. Moshi has a strong focus on design (they won three Red Dot design awards in 2018), the company uses light material and they have been in business since 2005. Plus, Moshi is headquartered in San Francisco, which guarantees fast and reliable support for US-based customers. Especially if you are a photographer or videographer, own a MacBook Pro, and like the feel & look of well-designed gadgets made out of high-quality materials, then the Moshi USB-C Multimedia Adapter is right for you! Andreas used to develop black & white films at the age of 14 by turning his bathroom into a darkroom. After getting his master's degree in economics, he worked as a marketing consultant in Asia. Today he is all into digital photography and content creation.